Application Consultants are IT experts who help and assist the clients on how to potentially use the company’s Software. 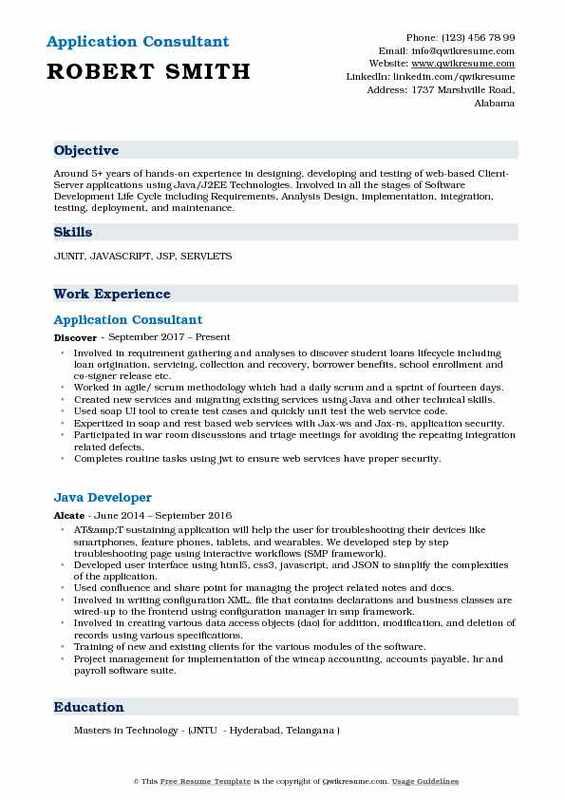 An Application Consultant Resume usually describes some responsibilities such as preparing designs and mapping documentation, installing, developing and configuring system software, performing data analysis and troubleshooting implementations. These consultants also need to discuss with clients their requirements and identify the project purpose, collaborate with other team and implement a suitable new system for the company. To perform these tasks successfully an Application Consultant is expected to possess knowledge of various technologies like SQL, Hardware/software, BI, database principles and programming fundamentals. Their functional and technical competencies should include multitasking abilities and manage stressful situations. 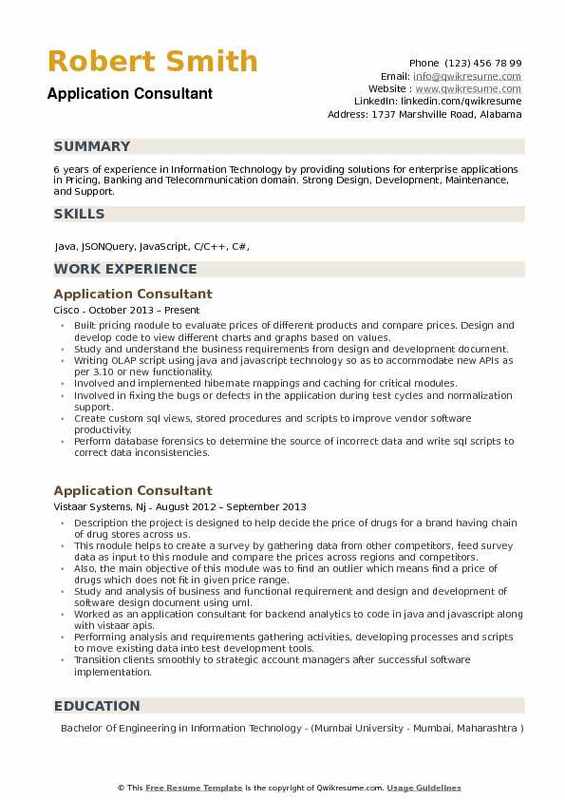 Eligible resumes depict a Degree in Computer Science, Information Systems or related field. 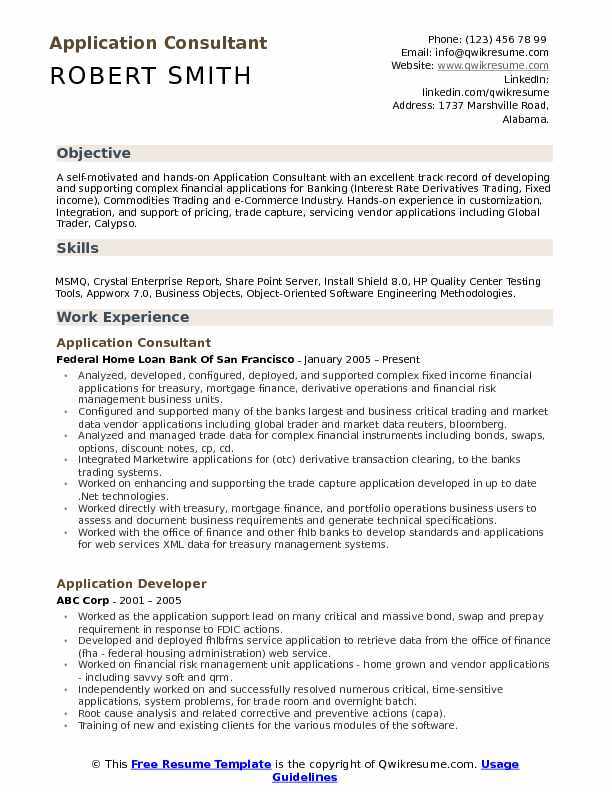 Summary : A self-motivated and hands-on Application Consultant with an excellent track record of developing and supporting complex financial applications for Banking (Interest Rate Derivatives Trading, Fixed income), Commodities Trading and e-Commerce Industry. Hands-on experience in customization, Integration, and support of pricing, trade capture, servicing vendor applications including Global Trader, Calypso. 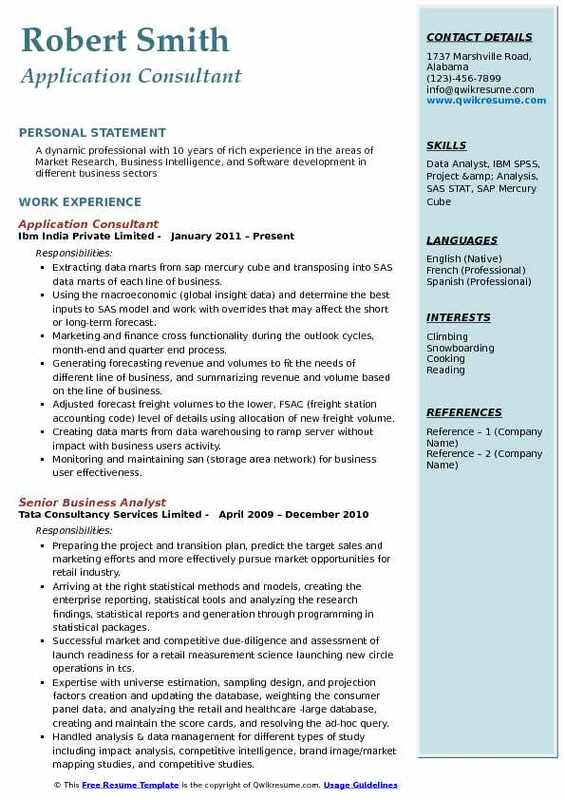 Skills : MSMQ, Crystal Enterprise Report, Share Point Server, Install Shield 8.0, HP Quality Center Testing Tools, Appworx 7.0, Business Objects, Object-Oriented Software Engineering Methodologies. Analyzed, developed, configured, deployed, and supported complex fixed income financial applications for treasury, mortgage finance, derivative operations and financial risk management business units. Configured and supported many of the banks largest and business critical trading and market data vendor applications including global trader and market data reuters, bloomberg. Analyzed and managed trade data for complex financial instruments including bonds, swaps, options, discount notes, cp, cd. Integrated Marketwire applications for (otc) derivative transaction clearing, to the banks trading systems. Worked on enhancing and supporting the trade capture application developed in up to date .Net technologies. Worked directly with treasury, mortgage finance, and portfolio operations business users to assess and document business requirements and generate technical specifications. Worked with the office of finance and other fhlb banks to develop standards and applications for web services XML data for treasury management systems. 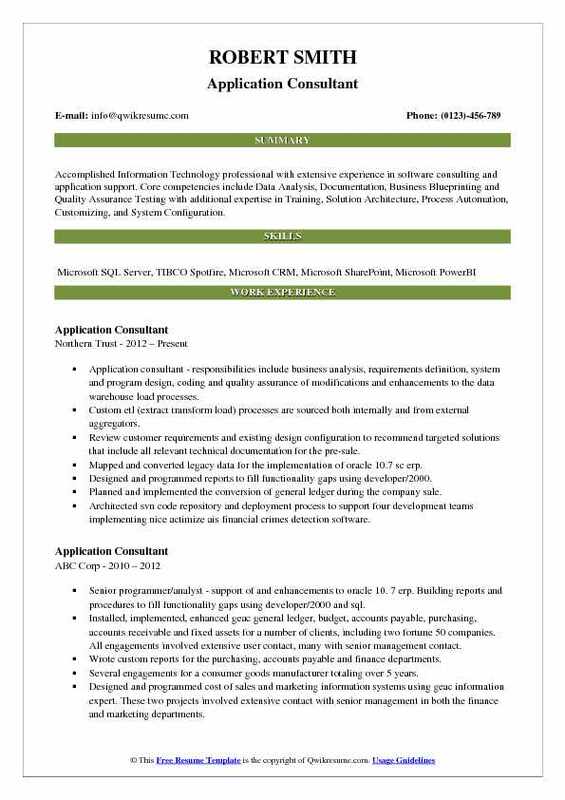 Headline : Over 6 years of experience in the field of IT as an Application Consultant with a focus in Software Testing and Quality Assurance for various Client-Servers, Windows, and Web-based applications. Have good knowledge in testing applications in various industry domains like E-Commerce, Telecommunication and Retail. Worked on multiple projects, like client/NCR pos self-service check-out point of sale terminals and mobile scan & go projects. Involved in creation of automated test cases for testing various web modules. Implemented page objects, data-driven using selenium web driver, java, and JUnit. Identified test cases to automate the test cases using selenium web driver, JUnit and java (eclipse ide) and contributed to the creation of the framework. Designed, developed and implemented pom based automation testing framework utilizing java, testing, and selenium web driver. Involved in automation of the test cases using selenium wd, JUnit, and maven. Executed the test plans on web and mobile (Apple & Android) as per requirements using the appium tool. Expert in software development life cycle (SDLC) of applications design & development, including scrum-agile & waterfall models. Build automation framework for angular, node. Js and involved in testing Ajax components with selenium web driver. Performed source code management and version control using git and build management using maven. Using page object and page factory model in junit/testing framework, ant, maven and using Jenkins to ensure web application is automatically tested via scripts. Designed, developed and implemented web services for user acceptance test (UAT) cases and plans. 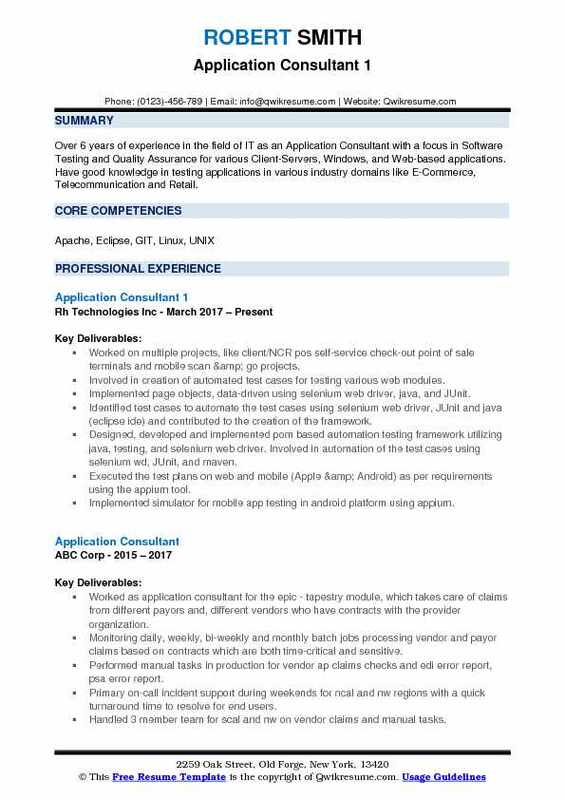 Summary : Accomplished Information Technology professional with extensive experience in software consulting and application support. Core competencies include Data Analysis, Documentation, Business Blueprinting and Quality Assurance Testing with additional expertise in Training, Solution Architecture, Process Automation, Customizing, and System Configuration. Application consultant - responsibilities include business analysis, requirements definition, system and program design, coding and quality assurance of modifications and enhancements to the data warehouse load processes. Custom etl (extract transform load) processes are sourced both internally and from external aggregators. Review customer requirements and existing design configuration to recommend targeted solutions that include all relevant technical documentation for the pre-sale. Mapped and converted legacy data for the implementation of oracle 10.7 sc erp. Designed and programmed reports to fill functionality gaps using developer/2000. Planned and implemented the conversion of general ledger during the company sale. Architected svn code repository and deployment process to support four development teams implementing nice actimize ais financial crimes detection software. 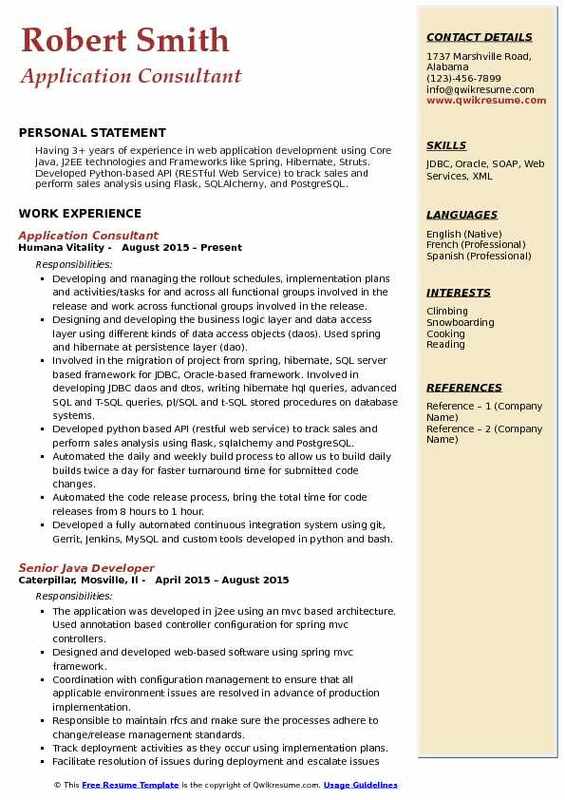 Summary : Certified PMP working as an Application Consultant with 9+ years of experience in designing and developing client-server and web-based applications for public and private companies in Java & J2EE technologies. Provide proof of concept/feasibility picture for a large project, documenting business requirements, planning the development and maintaining the scope of the projects. Used JAXB for XML binding to develop dynamic pdf forms for the policy using xsl. Read, debug and developed code to maintain the functionality of legacy wins digital application while transitioning to a new intuitive application. Prioritize development activities, assisting in the removal of any obstacles and motivating the project teams to meet key milestones on time and on budget. Performed cost-benefit analysis of integrating tools such as Jenkins, Jira, ansible, puppet, and chef to support a DevOps environment. Created process documentation and built demo Jira instances to support improved team workflow. Documented steps and processes for multiple teams for a major application upgrade. Extracting data marts from sap mercury cube and transposing into SAS data marts of each line of business. Using the macroeconomic (global insight data) and determine the best inputs to SAS model and work with overrides that may affect the short or long-term forecast. Marketing and finance cross functionality during the outlook cycles, month-end and quarter end process. Generating forecasting revenue and volumes to fit the needs of different line of business, and summarizing revenue and volume based on the line of business. Adjusted forecast freight volumes to the lower, FSAC (freight station accounting code) level of details using allocation of new freight volume. Creating data marts from data warehousing to ramp server without impact with business users activity. Monitoring and maintaining san (storage area network) for business user effectiveness. Integrating and migrating on new SAS grid environment from IBM p6 to IBM p7 machine. Creating the project report, project requirement details & report, test plan and test conditions for the projects. Objective : Around 5+ years of hands-on experience in designing, developing and testing of web-based Client-Server applications using Java/J2EE Technologies. Involved in all the stages of Software Development Life Cycle including Requirements, Analysis Design, implementation, integration, testing, deployment, and maintenance. Involved in requirement gathering and analyses to discover student loans lifecycle including loan origination, servicing, collection and recovery, borrower benefits, school enrollment and co-signer release etc. Worked in agile/ scrum methodology which had a daily scrum and a sprint of fourteen days. Created new services and migrating existing services using Java and other technical skills. Used soap UI tool to create test cases and quickly unit test the web service code. Expertized in soap and rest based web services with Jax-ws and Jax-rs, application security. Participated in war room discussions and triage meetings for avoiding the repeating integration related defects. Completes routine tasks using jwt to ensure web services have proper security. Create new service(s) as well as migrate existing services onto the paas platform as needed. Implemented log4j for logging errors, debugging and tracking using logger components. Involved in the bug fixing of various applications reported by the testing teams in the application during the integration and used hp alm for the bug tracking. 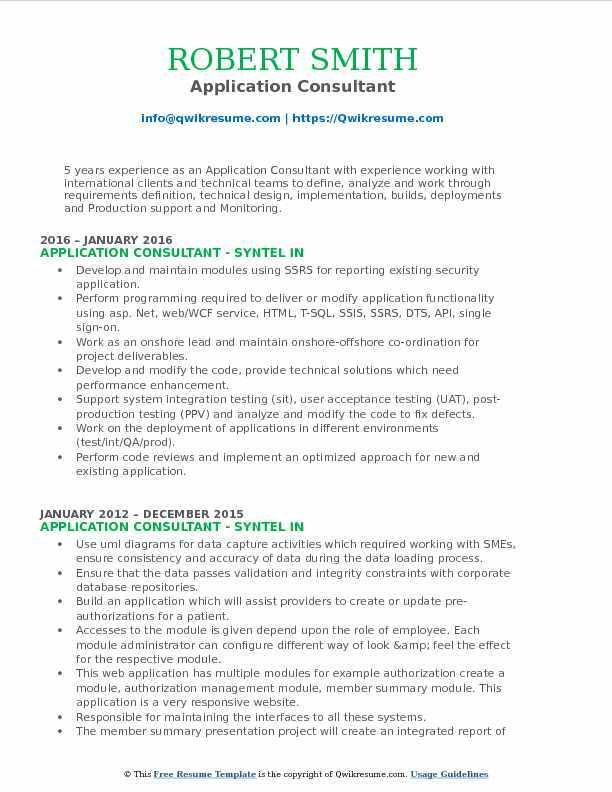 Headline : 5 years experience as an Application Consultant with experience working with international clients and technical teams to define, analyze and work through requirements definition, technical design, implementation, builds, deployments and Production support and Monitoring. Develop and maintain modules using SSRS for reporting existing security application. Perform programming required to deliver or modify application functionality using asp. Net, web/WCF service, HTML, T-SQL, SSIS, SSRS, DTS, API, single sign-on. Work as an onshore lead and maintain onshore-offshore co-ordination for project deliverables. Develop and modify the code, provide technical solutions which need performance enhancement. Support system integration testing (sit), user acceptance testing (UAT), post-production testing (PPV) and analyze and modify the code to fix defects. Work on the deployment of applications in different environments (test/int/QA/prod). Perform code reviews and implement an optimized approach for new and existing application. Perform production turn (deploying code on production server) validations and support post-production validations for business. Use dynatrace to identify issues in the running application in the production environment and work on resolving them. Work with dbas to develop/modify existing sql database structure to enhance application performance. 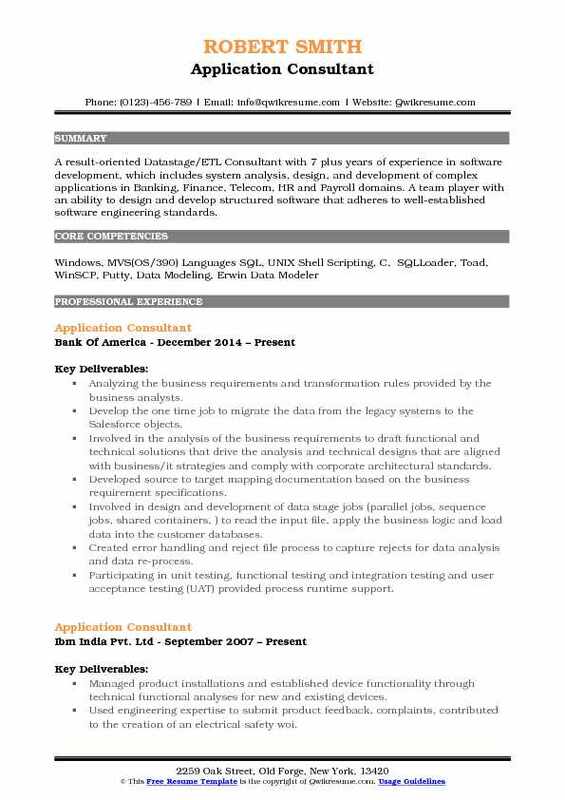 Summary : A result-oriented Datastage/ETL Consultant with 7 plus years of experience in software development, which includes system analysis, design, and development of complex applications in Banking, Finance, Telecom, HR and Payroll domains. A team player with an ability to design and develop structured software that adheres to well-established software engineering standards. Analyzing the business requirements and transformation rules provided by the business analysts. Develop the one time job to migrate the data from the legacy systems to the Salesforce objects. Involved in the analysis of the business requirements to draft functional and technical solutions that drive the analysis and technical designs that are aligned with business/it strategies and comply with corporate architectural standards. Developed source to target mapping documentation based on the business requirement specifications. Involved in design and development of data stage jobs (parallel jobs, sequence jobs, shared containers, ) to read the input file, apply the business logic and load data into the customer databases. Created error handling and reject file process to capture rejects for data analysis and data re-process. Participating in unit testing, functional testing and integration testing and user acceptance testing (UAT) provided process runtime support. Analyze performance and technical capacity issues with systems/applications. Documented the purpose of mapping so as to facilitate understanding of the process and incorporate the changes when necessary. 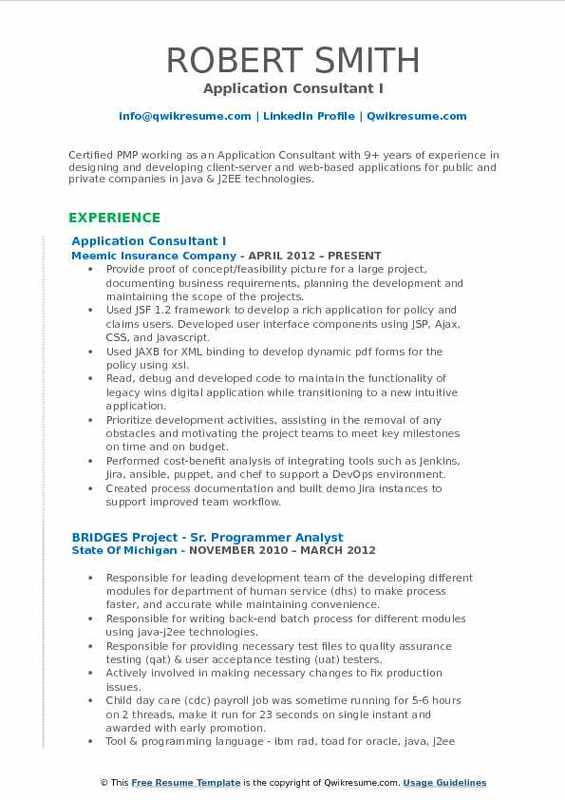 Objective : Having 3+ years of experience in web application development using Core Java, J2EE technologies and Frameworks like Spring, Hibernate, Struts. Developed Python-based API (RESTful Web Service) to track sales and perform sales analysis using Flask, SQLAlchemy, and PostgreSQL. Developing and managing the rollout schedules, implementation plans and activities/tasks for and across all functional groups involved in the release and work across functional groups involved in the release. Designing and developing the business logic layer and data access layer using different kinds of data access objects (daos). Used spring and hibernate at persistence layer (dao). Involved in the migration of project from spring, hibernate, SQL server based framework for JDBC, Oracle-based framework. Involved in developing JDBC daos and dtos, writing hibernate hql queries, advanced SQL and T-SQL queries, pl/SQL and t-SQL stored procedures on database systems. Developed python based API (restful web service) to track sales and perform sales analysis using flask, sqlalchemy and PostgreSQL. Automated the daily and weekly build process to allow us to build daily builds twice a day for faster turnaround time for submitted code changes. Automated the code release process, bring the total time for code releases from 8 hours to 1 hour. Involving in bug fixing of various modules that were raised by the testing teams in the application during the testing phase. Working on service virtualization, in order to create a new endpoint to the soap services during a server outage. Headline : 6 years of experience in Information Technology by providing solutions for enterprise applications in Pricing, Banking and Telecommunication domain. Strong Design, Development, Maintenance, and Support. Built pricing module to evaluate prices of different products and compare prices. Design and develop code to view different charts and graphs based on values. Study and understand the business requirements from design and development document. Involved and implemented hibernate mappings and caching for critical modules. Involved in fixing the bugs or defects in the application during test cycles and normalization support. Create custom sql views, stored procedures and scripts to improve vendor software productivity. Perform database forensics to determine the source of incorrect data and write sql scripts to correct data inconsistencies. Provide guidance, expertise, and consulting to customers end users in the assessment of application design, application use/efficiency, and training needs.